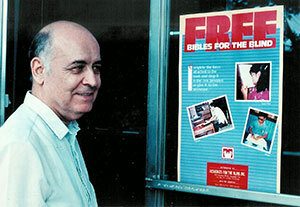 Resources for the Blind began as a personal project of Dr. Arthur Lown to produce part of the Filipino Bible in Braille. Blind since childhood, Dr. Lown left his position as Director of Services for Blind Students in the Atlanta school system in 1972, and moved to the Philippines to serve as an administrator in the Manila office of the Summer Institute of Linguistics. In 1980, three blind Filipino pastors, learning about Dr. Lown's blindness and interest in Bible translation, visited him to request help in transcribing some of the Filipino Bible into Braille. Thus began the first project of what would become Resources for the Blind. After supervising the completion of the Filipino Braille New Testament, Dr. Lown immediately began work in Brailling Scripture in other Philippine languages. Cassette and large print editions followed, for those who could not use Braille. All of these were distributed free of charge around the Philippines to those who wanted them. As requests for other kinds of assistance became more frequent, Dr. Lown asked permission from the Summer Institute of Linguistics to devote himself full time to the needs of blind Filipinos. In 1988, he gathered a Board of Directors and formally registered Resources for the Blind, Inc. (RBI Philippines) with the Philippine government as a non-profit charitable organization serving the blind. Dr. Lown retired in the early 1990’s and returned to the United States. In 1993 he registered Resources for the Blind International (RBI) as a 501(c)(3) tax exempt non-profit organization. Resources for the Blind International supports the work in the Philippines in various ways, and works to develop partnerships in other countries. Since that first project of producing Braille Filipino Bible portions, Resources for the Blind has expanded to three offices in the Philippines with over 60 staff and one office in the U.S. Our desire is that those who are visually impaired throughout the world will be reached through our partnerships with other Christian organizations, mission agencies, and churches. Our overall mission is to provide a holistic array of programs and services to meet the needs of those who are blind and to help them reach their God-given potential in life and service.